enet is a wholesale fibre & wireless network operator providing services to multiple Retail Service Providers (RSPs) across Ireland. Services include managed Ethernet, managed SDH, dark fibre provision and FTTB/H with VoIP. Rolling out high-speed fibre broadband access networks involves a huge capital investment with a long payback period.This investment is typically shared across a number of wholesale operators in any one country, sometimes via public-private partnership. The result is often a “patchwork quilt” of high speed broadband networks operated by different providers, each with its own inventory of premises that it has passed or provisioned, and each with its own provisioning and management gateway for Retail Service Providers (RSPs) to connect to, with many associated technical challenges. a service to aggregate the offerings of multiple wholesale networks into a single point for access by RSPs, greatly improving the ability for RSPs to market and efficiently provision broadband services to a wider business and consumer base, and in turn increasing the use of our client’s backhaul network assets and their resultant revenues. The opportunity created a requirement for an automated B/OSS Wholesale Aggregation Platform capable of efficiently combining qualification, provisioning, billing, ticketing and lifecycle management across both wholesale and retail services, over a range of different network and access technologies. The solution needed to be cloud based, secure, flexible and scalable to support large, small and specialist RSPs. With its domain expertise in telecommunications and significant BSS/OSS software assets, Sonalake engaged with our client to undertake a detailed analysis of its emerging business process and technical requirements. The resulting solution was based upon Sonalake’s Verax B/OSS cloud based software, making the following high level functionality available to its customers via a Web Self-Service Portal, with backend technology and integration enabled via restful APIs:. 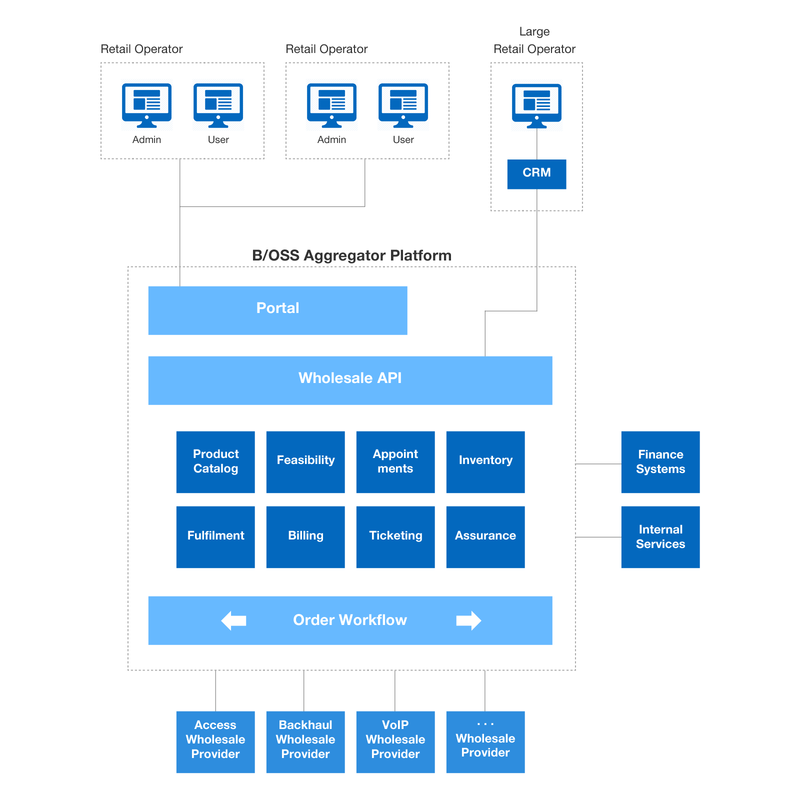 The API-centric solution included a series of complex technical integrations towards several third-party wholesale providers of access technologies and assets. The fully scalable solution hosted on Amazon Web Services (AWS) makes use of AWS direct connect for performance, reliability and security. Sonalake and our client employed a highly collaborative and agile project methodology to design, develop and deploy the solution based on leading open source software technologies. This consultative and iterative process allowed Sonalake to efficiently support refinement of customer requirements as the project has been delivered on time and within budget in fortnightly sprints, with demonstrations being deployed onto a customer test environment as the latest sprint outputs were made available. This major ongoing business transformation project has involved extensive business process and technology challenges. The collaborative approach engaged by Sonalake and our client is facilitating the evolution of an existing business model to deliver new services and revenue opportunities together with streamlined processes and customer satisfaction. New revenue opportunities – Enabling the sale and provision of additional services to RSPs together with increased capacity usage of existing backhaul infrastructure investments. Increased efficiency – Facilitating high volume wholesale and retail services through the automation of a range of inventory, ordering and billing related processes as well as customer self-service. Reduced risk – The scalable and flexible AWS hosted solution enabled a lower initial cost with the confidence to be able to scale to support even the largest of retail service provider customers as the new business model evolved.